Product information "Dyson V6 Animal Cordless Vacuum Cleaner"
From cobwebs on the ceiling to hidden dust below the TV, this portable Dyson vacuum can clean anywhere you need. The full-length detachable wand saves stretching and bending, giving you the reach of a traditional corded upright. It also has the latest motor head with carbon fibre filaments, and a low profile for getting right underneath the furniture. When you need to clean a targeted area, simply remove the extension. The V6 Animal then becomes a handheld, with a motorised tool for picking up pet hair from the stairs or upholstery. It has bristles that work between carpet fibres, to give a thorough clean. Use the rigid crevice nozzle to get right into those nooks and crannies, or use the combination tool to protect surfaces like shelves. Whether you’re picking up a few crumbs or having a big spring clean, using this Dyson handheld is quick and easy. With the dual power mode – 28 AW of power as standard and 100 AW in Boost mode – no task is too challenging for the V6 Animal. Dyson has designed this model to target pet hair, which is notoriously tricky to remove, and makes light work of any dirt. This model features Dyson’s digital V6 motor, which has a magnet spinning at more than 100,000 times a minute. And, the 2 Tier Radial™ Cyclones use centrifugal forces to maximise air flow. With these advanced technologies, you’ll find extreme power even from this small and light handheld. Powered by a re-engineered nickel manganese cobalt battery, the V6 Animal removes as much dust as a corded vacuum. Use it as an additional tool or as an upgrade from your main cleaner. Simply unclick from the neat, wall mounted docking station, and away you go. The Dyson V6 Animal is cordless, making it ideal for cleaning your car or home in a hurry. Once charged, it’ll run for 20 minutes, and the improved trigger means you can save battery life between uses. There’s a built-in bin, so you don’t have to worry about changing bags. Simply push the button for hygienic emptying. And, if you need to change the conical filter, it’s easily accessible and lifetime washable. Move round your home in style with this vacuum’s colours, featuring a design with iron/sprayed nickel and red/purple. 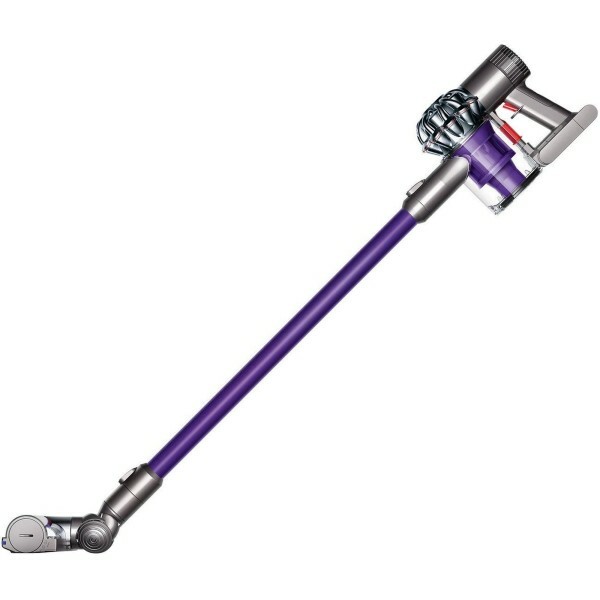 This Dyson model also features advanced V Ball technology, so it’s smooth and easy to vacuum around your home. Related links to "Dyson V6 Animal Cordless Vacuum Cleaner"
Customer evaluation for "Dyson V6 Animal Cordless Vacuum Cleaner"